A Book So Fathomless: Bout of Books Sign Up! 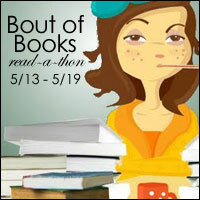 I saw that you were doing the Bout of Books read-a-thon. I've followed you to make sure I get your updates! I would really appreciate it if you could come over to my blog to check it out, and if you like it, you can follow me as well. I hope you'll follow my read-a-thon journey. I blog about my favourite music and books hence the name Music Plus Books. Thank you for following us Laura. We looked at your blog too, which is awesome by the way, and we are now following you back.